Astro Torah: Dreaming of Astronomically Fat Cows! 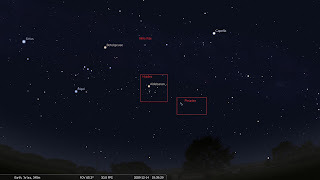 There are two star clusters, small patches of sky that contain a large amount of stars relative to the small space they occupy, that were discussed by the Ancients, the Hyades and the Pleiades. Both are found in the constellation Taurus/Shor, the Ox. The Pleiades were associated with seven sisters and their five half-sisters were those that the Hyades are said to represent. 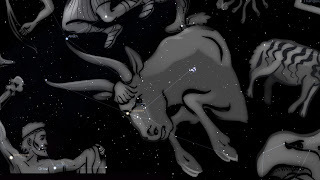 The constellation Taurus/Shor has its horns dipping into the Milky Way. The Milky Way is the numerous stars that lie in the plane of our galaxy. Due to their distance from us, and that they are so close to each other (relatively), they appear as a nebulous cloud that wafts through the sky. Or, one could say, they appear as if someone has spilled milk across this area of the sky. Unfortunately, the Milky Way is too faint to see unless one can get far away from city lights. The Milky Way has also been compared to a celestial river since it appears like a glowing river that runs through the night sky. These clusters can be seen as the two sets of cows that emerged from the river. Since both are in the constellation Taurus/Shor, the Ox, it is reasonable to associate these clusters with cows. These two star clusters, Hyades and Pleiades, would, therefore, appear to be emerging from the river of the Milky Way. The Pleiades, being further away would appear to have emerged first and their half-sisters would be following shortly after. As the story goes, the Hyades had all committed suicide after the death of one of their other siblings and they are seen as constantly weeping. The grim circumstances surrounding these stars does not conjure up a nice image; hence, the emaciated cows. The obvious question that one should ask is that although the Pleiades symbolize seven sisters, and therefore, seven cows, the Hyades are only five. How could they be the second set of seven cows that emerged from the river? The answer might be that the representation in the sky is depicting what actually occurred and not what was seen in the dream itself. Although there were seven years of famine, we find that for the first two of these years Yosef had stored enough food to support the populace (see Bereishis 47 and Rashi Bereishis 47:18). Nothing is seen regarding the la st five.